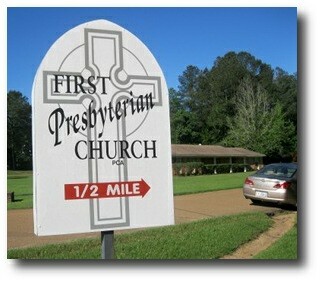 Welcome to the Internet home of First Presbyterian Church of Kosciusko, Mississippi. Here you will find a wealth of information, media, and other up-to-the-minute resources to help you engage in and enjoy a relationship with the community at First Pres. Kosciusko. It is our honor to serve you here in the virtual world in ways that will complement our care for you in real life: from the latest news and announcements, to the online church calendar, to the weekly worship bulletins (usually delivered here no later than Saturday morning) to aid you in preparing for upcoming worship, to years of sermon audio files online to stream or download as you prefer. We are working hard to make our Internet presence both content-rich and readily accessible to you whether you are browsing from your home desktop, or are on the road with only your smart-phone or other portable communications device. But as hard as we work on our online presence, we would be very happy to meet you, see you, and be with you (something for which a Web site will never be a good substitute). Our Sunday worship times are 10:20 am and 5:00 pm, and our Sunday School groups for all ages meet at 9:00 am. If you would like to be with us and live in the Kosciusko/Attala County area but cannot get to us, call our church office at (662) 289-2435 and we will arrange transportation. Now click the door icon below to launch into the latest news, sermon posts, and more in your FPC Kosciusko online experience. You’ll also navigate the site using the drop-down menus above, and the colored text links throughout. We hope you enjoy the time you spend with us online and that you will grow in the grace and knowledge of our Lord Jesus Christ by having been here.